The bureau of economic analysis will release the advance estimate of second quarter GDP on July 28. What do the expectations for the quarter currently show? 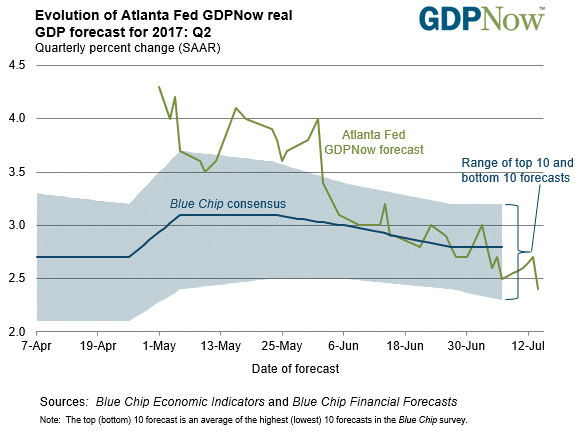 The next two graphs picture the dichotomy of forecasts between two of the Federal Reserve Banks — the Atlanta and New York. More importantly, as the graphs show, their second quarter forecasts show a downward trend. Two economists from the major investment banks also show the same downward trends and look for second quarter GDP growth to come in slightly below 2%. Assuming these forecasts of GDP growth around 2% prove correct, it would represent continuation of steady but uninspiring GDP growth that infects the U.S. economy. As a reminder, first quarter GDP showed an increase of 1.4%. More important, in our view in judging first quarter activity, real final sales to private domestic purchases grew 2.9%. This figure represents sales going across the counter. Why the difference between these two figures? Reduced inventories rather than increased production supplied the strong growing end demand – thus pulling down overall first quarter GDP growth. While tempered by recently slowing retail sales, we expect second quarter GDP growth will likely benefit from a rebuilding of inventories. If inventory growth proves correct, unlike the first quarter, inventory change will add rather than reduce GDP growth rates. A major uncertainty to the second quarter GDP advance estimate comes from the seasonal adjustments made by the government. Each year, first quarter GDP advance estimates consistently reflect negative distortions cause by seasonal adjustment formulas. For example, this year’s first quarter advance estimate showed GDP growth of 0.7%. Then two months later, the third and final estimate of first quarter GDP doubled to 1.4%. Mathematically, to offset the negative first quarter seasonal adjustments, we expect a positive influence on second quarter GDP results from seasonal adjustment formulas. If that proves correct, a positive tilt to the second quarter GDP advance estimate should result. Adding all these variables together suggests the second quarter GDP advance estimate may show a more positive tone than many economic observers expect. Our caveat, this view goes counter to the declining second quarter GDP forecast trends shown in the graphs. Nonetheless, if our view proves to be the case, the reaction from investors should prove positive—at least initially. Assuming the 2% consensus forecast proves correct, the Fed will likely continue to pull in its still accommodative policies. In the past we expressed a view that the Fed would move more aggressively than the financial markets expect. Our point-of-view continues despite chair Yellen’s recent dovish comments before congress. 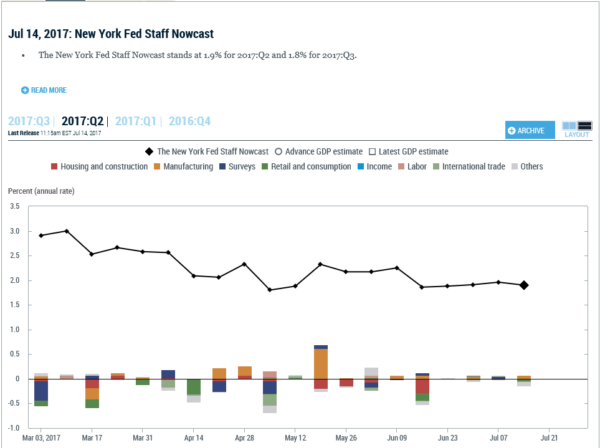 It remains our view that the Fed will be focused on rebuilding the tools it uses to counteract future economic slowing. At the same time, the real economy shows little excesses that would lead to a possible economic slowdown in the near future. We expect most investors will continue to show comfort with an economy producing slow growth with few macroeconomic surprises. And investors will likely continue seeking areas of growth that offset the shortage of economic growth. At the same time, in our view, investors should also make some effort in their asset allocations to offset the uncertainties caused by widespread investor complacency.